There is no current visible trace of Tywardreath Priory. There have been recent attempts by the local people of Tywardreath to find it again using modern means. But it has been so flattened and all top stones and other artefacts taken away over the centuries, that discovery is difficult. ‘The ancient priory of Tywardreath has long been so entirely levelled with the ground, that it is not very easy even to ascertain its site. Some time ago the present vicar obtained leave to dig the ground on its supposed site in search of stones for erecting a vicarage house. The place where he made an excavation for this purpose appears to have been the east end of the priory chapel; and as some measurements were taken at the time , and I have, with the permission of the landlord, opened the ground in several places, partly of throwing some light on its architecture, the following particulars may not be unacceptable. The chapel appears, so far as could be ascertained by measurement, to have been eighty feet long, by fifty seven wide, with a semi-circular end towards the east; strengthened by four buttresses of wrought Pentewan stone, two feet wide, and ornamented by four pilasters; within the shafts are a single half-column, four inches in diameter. At each angle was a handsome piece of architecture, as it was described to me, of which pilasters, resembling those already described, formed a part, but with the base five inches wide, and the mouldings in proportion. In the vicarage garden, adjoining the west end of the chapel, a fragment of a stone arch was found, with a fleur-de-lis elegantly carved in deep relief; the same devise appears on the church stile, and in a coat of arms in one of the windows of the church, and appears from tanner to have been part of the arms of the priory. The wall of the chapel is the south wall of the churchyard. Although nothing now remains above ground, there is a story which abounds that the last stone was shipped back to France by the last Prior. There is no proof of this, although the story has been passed down by oral tradition. The Priory stood at the water’s edge and ships would dock and leave from here. 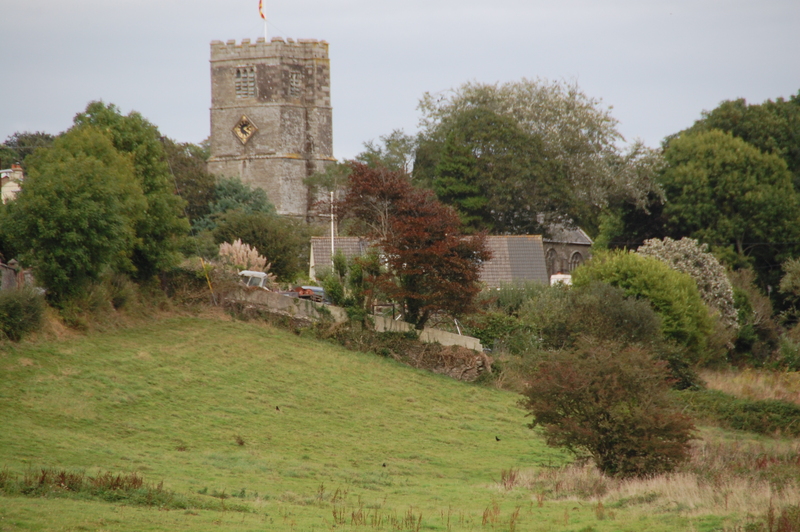 Much of Par and St Blazey was underwater and the sea fingered its way inland to Prideaux and further at high tide. The monks built a causeway from Tywardreath to St Blazey, but three men, one a monk, died one day when they failed to check the tides. A ferry was used at other times. As the Priory expanded, so did the satellite houses, farms and alehouses which would normally surround such a place. The waterside was busy and sea travel and fishing occurred here in addition to Fowey. It has often been reported since the fall of the Priory, that monks are seen to wander about the church and the area and their chants heard. The seal of the convent was a saltire or St. Andrews cross. Sometimes the seal was displayed between four fleurs-de-lis. ‘Tywardreit a cell to Angiers in France. This entry gives the impression that Robert de Cardinham built the Priory at Tywardreath, however deeper investigation shows that the priory was already built and in use by the ‘black monks’ of France and that Cardinham made substantial financial contribution to the priory’s upkeep and extension. Prior to 1066 the lands of Tywardreath were in the control of the Saxon Lord Cola before the Conqueror and then fell to Richard FitzTorold, the steward of Count Robert, the King’s brother. Robert FitzWilliam who died sometime between 1169 and 1177, is recorded in 1166 Cartae Baronum as the holder of the lands which had been formerly been held by Richard FitzTurold. In 1169, he and his son Robert made a gift to Tywardreath Priory. Following his death, his son Robert de Cardinham was forced to pay a large feudal relief in Devon in order to gain his inheritance. He owned at least 71 Knight’s fees in Cornwall, from the successor of the Count of Mortain. One of his holdings was a mill at Cardinham which serviced the Tywardreath Priory. It was his son, Robert de Cardinham (died 1230) – heir of Robert FitzWilliam (de Cardinham) – who made gifts to the already established priory at Tywardreath, written of in the Monasticon Anglicanum. A long term and well established trade route passed through the area from the Camel to Fowey. Goods were shipped from Ireland to Cornwall and then from Fowey to Britanny and the Mediterranean and back. This was a hugely influential area where monks and travellers came to make secret meetings and where smugglers and pirates abounded. King Henry II and Queen Eleanor of Aquitaine had great connections to her ancestral inheritance in Angers and it may have been this connection to the house of SS Sergius and Bacchus which encouraged the French monks to arrive and establish a daughter house at Tywardreath. Sergius and Bacchus were two Romans violently executed and martyred when they refused to approve of their leaders murderous violence. Henry and Eleanor wanted a spy satellite in this faraway edge of his kingdom. According to the History of Glasney College (James Whetter); the foundation date for Tywardreath Priory is given as 1088, although the building was not completed until 1135. Osbert was the first prior who ruled by the favour of Lord Robert FitzTorold. Henry’s chief agent, the Bishop of Salisbury set in motion the beginning of the priory. The Tywardreath connection is the first documented reference I have so far found to the Manor of Pridias (later Prideaux), although many connections are documented in retrospect. The charter was initially drawn up in 1120-1122 between Canon Ordagar and Richard de Pridias, the son of Paganus, but Richard died in 1122. This document remained unsigned until 1130 when Baldwin, the son of Richard, came of age and was rewritten. The Benedictine priory initially housed about seven monks, the endowment being sufficient for that number. The priory, although poor, controlled the port of Fowey and had lands scattered over Cornwall. They rented some of the Pridias lands and I assume that this is what the charter was for. The Crown began to mistrust the monks, an opinion which continued until its eventually downfall during the purges of Henry VIII. They were believed to be passing on gossip and finances to the French Abbott and assisting traitors. For this reason the Crown often took the monastery under its protection and confiscated money and goods, leaving the monks poor and reliant upon the goodwill of their neighbours. These neighbours were rather suspicious of the French monks, but used them for their skills with herbs and their ability to work in harmony with the more ‘natural’ practices of the first people of Cornwall. There was an annual charge on the priory’s income, which was known as a corrody. This was to pay for the board and lodging of founders when they visited. Originally a voucher, later money, was used and this could then more easily be transferred to the Crown as a pension. In 1486 Henry VII recommended that his servant William Martyn be granted a corrody of 5 marks a year to be charged on the manors of Tywardreath and Trenant. A corrody was held in Tywardreath Priory in 1509 by Hugh Denys of Osterley Groom of the King’s Close Stool to Henry VII. On the death of Denys, Henry VIII transferred the corrody (“in the King’s gift by death of Hugh Denys”) to John Porth, another courtier. Records show that there were 19 unsuccessful attempts to persuade Prior Thomas Colyns to retire gracefully from office shortly before the Dissolution, but he would not. It is not known whether the Priory documents went into the Arundell archive from the Prior or the King’s agent. At the time of the Dissolution the Arundells were vying with the Grenvilles and Godolphins to obtain the lands of Tywardreath (see AL Rowse, Tudor Cornwall, pp. 209-10.). Thomas Arundell came into possession of the priory documentation. He was for a while in charge of the commission for dissolving the monasteries and would thus have been one of the few people in a position to remove the documents from the priory. Thomas could arrange to have the documents removed to Lanherne hoping that his family would acquire the priory lands. They didn’t succeed however. Grenville held them instead. At Tywardreath Priory, newly writ documents were often smoked to make them look old and substantiate a claim. Oliver’s Monasticon displays a document indicating that Grenville held the lands and then leased them to Sir John Arundell and Arundell sub-let the lands to Laurence Courtenay in 1542 (Oliver, Monasticon, p. 45, no. XXIV.). The documentation regarding the priory still remain in the Arundell Archive. John Grenville (CRO, CA/B44/1) eventually sold the lands to the Rashleigh family and the Earl of Hertford (Rowse, Tudor Cornwall, p. 205 and p. 210.). 1. Manor of St Austell: seat of manor was in St Austell; tenements also in St Stephen in Branel. 2. Manor of Fentrigan: not an original manor but created as a means of administering the priory’s scattered lands in Altarnun, Davidstow, Lesnewth, Otterham, Treneglos, Warbstow, Week St Mary and Whitstone. 3. Manor of Fowey: seat of manor and all tenements were in Fowey. The borough of Fowey belonged to Tywardreath Priory. The court rolls here are for Fowey manor; it is not clear whether there was also a separate borough court. 4. Manor of Gready: not an original manor but formed from scattered lands in St Austell, Cardinham, Lanlivery, Lanivet and Luxilian. 5. Manor of Porthia: not an original manor but formed from scattered lands in St Anthony in Meneage, Gulval, St Ives, Lelant, Madron, Manaccan, Towednack, Zennor and possibly Ludgvan. 6. Manor of Trenant: seat of manor was in Fowey; tenements also in Tywardreath. 7. Manor of Trevennen: seat of manor was in Goran; tenements also in St Erme, Goran, St Michael Carhays and Probus. 8. Manor of Tywardreath Prior: seat of manor was in Tywardreath; tenements also in St Austell, St Endellion, St Enoder, St Sampson Golant, Lanlivery, St Martin by Looe and Menheniot.